This landmark ice cream shop on State Street, which dates back to the 1940s, is bringing its creamy goods to Grand Central Market in July, where it will open a location next door to Wexler’s Deli. They’ll offer sixteen flavors, including double peanut butter chip, Eureka lemon, Oaxacan chocolate, olive oil, and raspberry jam. Set to open near the corner 9th and Broadway in Downtown, adjacent another New York import (The Ace Hotel) this wacky soft serve shop will offer cones like the Salty Pimp (sea salt, caramel, and chocolate) and the Bea Arthur. Expect an opening later this summer. Portland’s famed ice cream purveyor is coming to Larchmont in August with its first location outside Oregon. Stock up on offbeat flavor combination made using local produce like goat cheese and black olive brittle. More details can be found here. 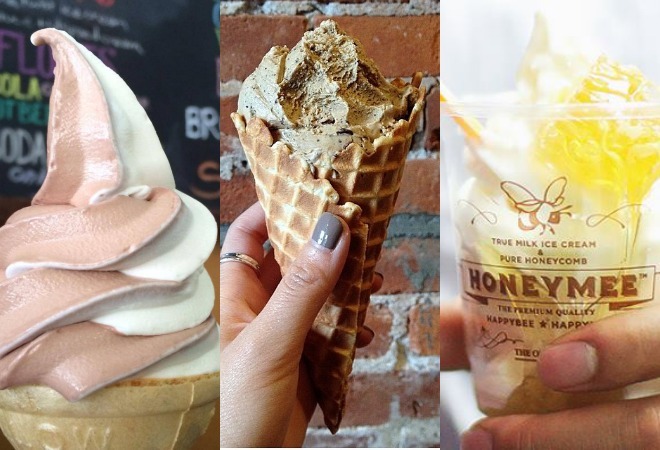 Although HoneyMee isn’t based out of Korea, this quaint Koreatown shop specializes in milk-flavored soft serve topped with fresh honeycomb, a popular treat in Korea during the summer months. You can even try it layered inside a sweet bun for the ultimate ice cream sandwich. A fleet of retro-inspired ice cream trucks serving organic scoops has already hit the streets in L.A. (you can follow them on Twitter), but NYC-favorite Van Leeuwen has its sights on another goal: A Downtown brick-and-mortar planned for this summer. One of the cornerstones of chef Brooke Williamson’s new multi-concept restaurant space in Playa Del Rey is her new ice cream shop, Small Batch. They’ll be flavors like Thai tea and Malted Chocolate Crunch, along with sundaes, popsicles, and shakes. One of the first tenants of the Spring Street Arcade (future home to Guisados and Bierbeisl Imbiss), this locally based gelato shop serves 16 flavors, including sesame-halva and poblano pepper. If you’re need of a caffeine boost, opt for the espresso-topped affogato. Another branch of Scoops has landed inside Chinatown’s Far East Plaza. The shop’s signature flavor? Bianco Bread, the popular brown bread flavor enhanced with a touch of mascarpone. The famed Italian gelato wizards behind Bulgarini have opened a cart outside Picnik in Pasadena. Is there a better way to chase your gourmet sausage than with a scoop of Sicilian pistachio gelato?